One of the busiest times for GROWLS is seal pup season. On our coast seal pups are born from June to September with births peaking in July and August. Seal pups are coming. Very soon pregnant seal mothers will retire to rocky outcroppings off shore and “haul-out “ to give birth to a single seal pup Their gestation period is 9 to 11 months. Pups weigh about 11kg when born and can swim and dive soon after birth but need practice to increase skill and endurance. Newborns have large bright clear eyes; smooth mottled silver to black skin and a barrel shaped fat body. 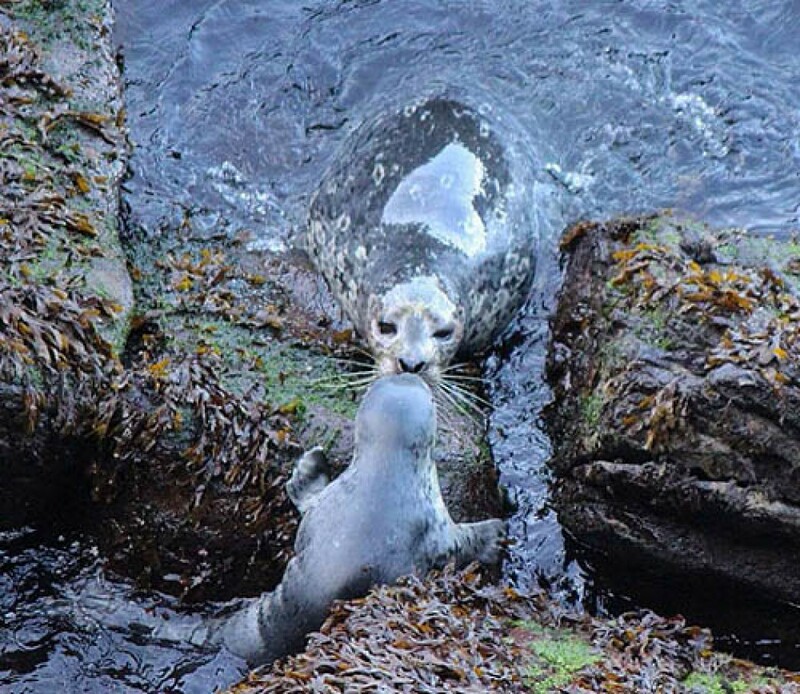 Seal pups stay with their mother for four to six weeks and gain weight rapidly nursing on her rich mothers milk. Then they are abruptly weaned. Mating occurred last year shortly after the mothers weaned their pups and now they are ready to mate again. Males will mate with several females during late spring and summer. A process known as delayed implantation occurs so seal pups are born in the right season. When a seal pup is born prematurely they are identified by a white fur coat known as lanugos, which is normally shed before birth. It is not always known why this happens other than premature births occur in all species. Our oceans are polluted and the fish eaten by seals will carry traces of toxic substances. Read the story of the rescue and release of our miracle seal pup Geneva www.growls.ca News & Events GROWLS Articles. 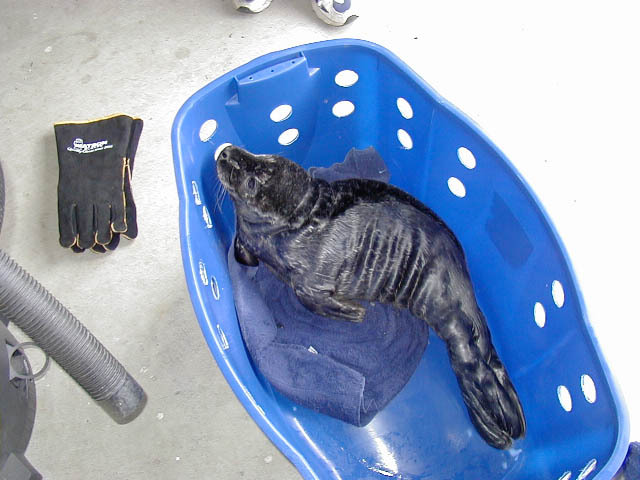 On June 18th, 2011 GROWLS rescued the first seal pup from a south end beach. The seal pup had been observed the day before and was heard crying for its mother. There were no other seals in sight. GROWLS was called and a GROWLS Rescuer attended. Careful evaluation determined the seal pup needed our help. 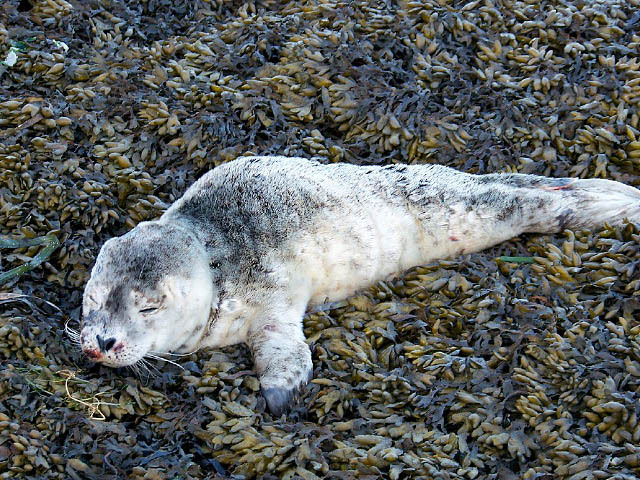 Why seal pups are abandoned is often unknown. Mothers could have died in birthing, sometimes shot, suffer boat prop injuries, big winds sometimes separate mother and pup. A total of thirteen seal pups were rescued by GROWLS in 2011. The seal pups GROWLS rescue show signs of any or all of the following, dehydration, emaciation, obvious wounds or cuts, lethargy. discharge from eyes or nose. These symptoms are reflected in their poor body condition that will be extremely thin and wrinkly skin. These pups need our help. Seal pups are often found at the high tide mark. Harbour Seals are not an endangered species. What we are doing is saving a life and giving the pup a second chance to swim free. A healthy seal pup is fat and sassy and usually will try to escape to the water. This where you can help. If you find a seal pup on the beach call GROWLS 250 714-7101 and a GROWLS volunteer will come and assess and see if this pup needs to be rescued. This is a wild creature and views you as a predator and could bite you. They have teeth. See the SEAL PUP TIPS clip and save in this issue of the Flying Shingle and keep it handy during seal pup season. There are two Seal Pup Rehabilitation Centres in BC. the Vancouver Aquarium and the Island Wildlife Natural Care Centre on Saltspring Island. GROWLS rescues seal pups under the permit of IWNCC and all of our seal pups are taken there. The seal pups receive excellent loving care and a holistic approach to healing is practiced. Living on Gabriola Island we have these incredible moments where we interact with wildlife. The Salish Sea and the marine mammals that call it home surround us. These experiences are long gone for city folks where everything has been whipped snipped clipped or paved over. Our vibrant wildlife and caring people make Gabriola the best place on Earth.